McClellan had failed to order sufficient forces to protect the capital when he left the Washington area for the Jamestown Peninsula in order to attack Richmond. When President Lincoln learned of the deception from General James Wadsworth, he ordered that the corps led by General Irvin McDowell held in the Washington area. On May 24, 1862, President Lincoln wired General McClellan: “In consequence of Gen. Banks’ critical position I have been compelled to suspend Gen. McDowell’s movement to join you. The enemy are making a desperate push upon Harper’s Ferry, and we are trying to throw Fremont’s force & part of McDowell’s in their rear.” McDowell’s 40,000-man force was used in the campaign President Lincoln launched against Confederate General Stonewall Jackson — to little effect. McClellan, who always believed he was outnumbered by the enemy, was infuriated by President Lincoln’s actions and believed it crippled his military plans. At West Point, President Lincoln talked to Scott of sending McDowell’s force to McClellan’s aid, and Scott endorsed the move. Popular opinion came up with other explanations for the President’s trip to West Point — which was necessitated by the ill-health of the corpulent general. 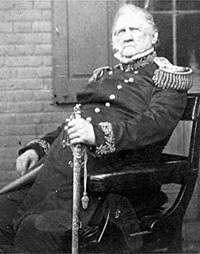 Even when he had been the general-in-chief of the army, Scott’s weight and illness sometimes prevented him from getting out of his carriage at the White House. New York attorney George Templeton Strong: “Faint-heartedness still prevails. The President’s visit to General Scott at West Point has stimulated the production of most authentic reports and reliable statements, mostly ‘asthenic’ and unfavorable. Today’s crop has been erroneous; for example, ‘McClellan is dead.’ ‘He is not dead yet, but dying of dysentery with typhoid symptoms.’ ‘A.B. was told by C.D. that he has a letter from his cousin, Major X.Y. on General Z.’s staff, stating that our McClellan has lost his mind and gone crazy with anxiety and excitement.’ ‘Lincoln wants Scott’s advice about McClellan’s successor. '”2 Much later, relatives of Rev. Henry Ward Beecher suggested President Lincoln was in the habit of visiting the Brooklyn preacher at night — and that this one such occasion (an impossibility given the timing of the visit). According to Scott biographer John S. D. Eisenhower, it was Scott who took the initiative on the issue. “During this visit by the President, Scott seized the opportunity to recommend that Major General Henry W. Halleck be appointed general-in-chief of the Army to replace McClellan, the field commander. Lincoln assented, and shortly afterward brought Halleck to Washington with that title. Lincoln may not have been satisfied with Halleck’s later performance. In addition, his own self-confidence in his role as commander-in-chief was growing. In any case, Lincoln did not seek Scott’s advice again; indeed, this was the last time Scott would ever see Lincoln alive.”3 Within days, President Lincoln recalled Halleck from his western command and installed him as general-in-chief of the army — a position which McClellan had held from November 1861 to March 1862. The President having stated to me, orally, the present numbers & positions of our forces in front of the rebel armies, south & South west of the Potomack, has done me honor to ask my views, in writing, as to the further dispositions now to be made, of the former, towards the suppression of the rebellion, & particularly of the army under McDowell, towards the suppression of the rebellion. Premising that, altho’ the statements of the President were quite full & most distinct & lucid — yet from my distance from the scenes of operation, & not having recently followed them up, with closeness — many details are still wanted to give professional value to my suggestions— I shall, nevertheless, with great deference, proceed to offer such as most readily occur to me — each of which has been anticipated by the President. I consider the numbers & positions of [John C.] Fremont & [Nathaniel] Banks, adequate to the protection of Washington against any force the enemy can bring by the way of the Upper Potomack, & the troops, at Manassas junction, with the garrisons of the fort on the Potomack & of Washington, equally adequate to its protection on the South. The force at Fredericksburg seems entirely out of position, & it cannot be called up, directly & in time, by McClellan, from the want of rail-road transportation, or an adequate supply train, moved by animals. If, however, there be a sufficient number of vessels, at hand, that force might reach the head of York river, by water, in time to aid in the operations against Richmond, or in the very improbable case of disaster, there, to serve as a valuable reinforcement to McClellan. The defeat of the rebels, at Richmond, or their forced retreat, thence, combined with our previous victories, would be a virtual end of the rebellion, & soon restore entire Virginia to the Union. The next remaining important points to be occupied, by us, are — Mobile, Charleston, Chattanooga. These must soon come into our hands. Timothy D. Johnson, Winfield Scott: The Quest for Military Glory, p. 240. Allan Nevins, editor, Diary of the Civil War, 1860-1865: George Templeton Strong, p. 233 (June 25, 1862). John S. D. Eisenhower, Agent of Destiny: The Life and Times of General Winfield Scott, p. 403. John W. Starr, Jr., “Did Lincoln and Beecher Pray Together?”, p. 4 (Reprinted from Christian Advocate, April 22, 1926). Alexander K. McClure, Abraham Lincoln and Men of War-Times, p. 183-184. Ralph Gary, Following in Lincoln’s Footsteps: A Complete Annotated Reference to Hundreds of Historical Sites Visited by Abraham Lincoln, p. 273. Roy P. Basler, editor, The Collected Works of Abraham Lincoln, Volume V, p. 284 (June 24, 1862). Abraham Lincoln Papers at the Library of Congress. Transcribed and Annotated by the Lincoln Studies Center, Knox College. Galesburg, Illinois. (Letter from Winfield Scott to Abraham Lincoln, June 24, 1862).